Andy Murray joined the likes of John McEnroe and Boris Becker as a four-time Queen's Club champion with an impressive victory over Kevin Anderson. 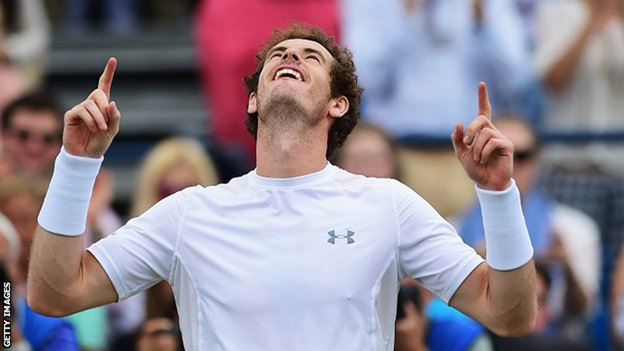 The British number one played superbly to win 6-3 6-4 in just 64 minutes at the Aegon Championships in London. Murray, the top seed, had earlier finished a rain-delayed semi-final, beating Viktor Troicki 6-3 7-6 (7-4). "I played better as the week went on and hopefully I can continue that into Wimbledon," the 28-year-old said. "I tried to play each point and come up with some great shots. I had to play that way if I wanted to win today." The Scot also won the title in 2009, 2011 and 2013, and he will hope to repeat his effort of two years ago when he went on to make it a grass-court double at Wimbledon. He can head to the All England Club in confident mood after dismantling the big-serving game of 6ft 8in Anderson. Having resumed his semi-final against Troicki at 11:00 BST with the score at 3-3, the Briton wrapped that match up in a clinical 65 minutes and returned two hours later to face Anderson. The South African, ranked 17th, had looked impregnable on serve as he made it through the draw but he found Murray's returns just too testing. Anderson made 78% of his first serves in the opening set but even that was not enough as Murray broke in game four, a brilliant backhand winner setting up the chance before Anderson netted a volley. A forehand winner made it 4-1 after just 17 minutes, and a ferociously focused Murray pumped his fist before heading to his chair. There was simply no let-up as he closed out the first set and proved similarly clinical when his chance arose in the second. A clever finish at the net and a thumping forehand return opened the door at 2-2, and break point was converted with a lob followed by a drop shot that was verging on the cruel. On he pressed, producing another beautiful lob and and a heavy backhand winner to move to the verge of victory. A swinging serve out wide completed a masterful display and brought Murray his 34th career title, and his fourth at the venue where he claimed his first ATP match win 10 years ago. BIRMINGHAM, England - Angelique Kerber battled more than two hours - and withstood an incredible 52 winners - to edge WTA Rising Star Karolina Pliskova for the Aegon Classic Birmingham title. Pliskova had Kerber in trouble time and time again in the match. After saving four set points in her 3-5 service game she ended up taking the first set in a tie-break, and she went up a break early in the second set too. And even though Kerber stormed back to take the second set, 6-3, and go up 5-3 in the third, Pliskova took control again, winning three games in a row to inch ahead 6-5 in the decider. But the No.4-seeded Kerber had one last fight left in her, unleashing an ace to hold serve and push the match to a third set tie-break, and then winning three points in a row from 4-all in that breaker to close the No.6-seeded Pliskova out after two hours and 16 minutes on center court, 6-7(5), 6-3, 7-6(4). Pliskova had bigger numbers in the match, but Kerber was just too sharp - the Czech had 51 winners to 42 unforced errors (a +9 differential) while the German had 34 winners to 14 unforced errors (+20). "Angie was playing great. I did everything I could so I'm not really disappointed," Pliskova said. "We all saw what she can do on grass - I felt like she was just everywhere, because she moves so well on grass, and it's always tough to play a lefty on grass. Her flat shots are tough to play against as well." "Karolina is a great player," Kerber said. "She served unbelievably well in the important moments, and she was hitting the balls so close to the lines. I had no chance in the big moments in the first set. "But I just kept fighting point by point, and it's just an unbelievable feeling to win today." Pliskova wasn't just going for her first Premier-level title, she was also going for a spot in the Top 10 - if she had beaten Kerber, she would have made her Top 10 debut and bumped the German out. But instead Kerber now has her third Premier-level title of the year, having already won back-to-back clay court titles at Charleston and Stuttgart. She's only the second player to win three titles at the Premier level or higher this year - Serena Williams has two Grand Slams and a Premier Mandatory. It was a big boost for Kerber ahead of the big one, Wimbledon, where she's a former semifinalist. "This gives me a lot of confidence," she said. "My goal coming to Birmingham was to get a lot of matches, and now I had my fifth of the week, so it couldn't be better preparation before Wimbledon. I'll just enjoy the day today, and we'll see what comes next, and we'll see what happens there." 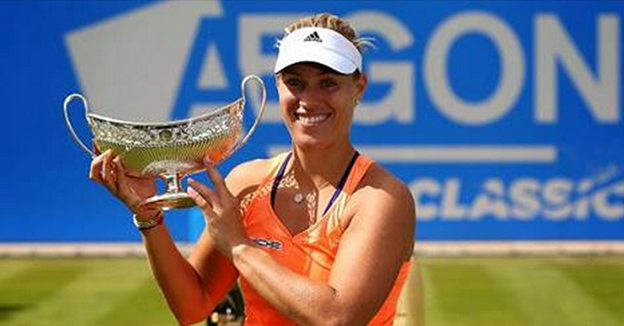 And how will Kerber celebrate her victory at the Aegon Classic Birmingham? "I think we'll go for pizza tonight!" she beamed.